The International Brotherhood of Electrical Workers (IBEW) Local 586 Ottawa is a forward thinking, highly skilled, and dedicated electrical union based out of Ottawa, Ontario. Since 1927, IBEW Local 586 Ottawa has been successfully representing licensed electricians and registered apprentices in the construction industry. Today, the IBEW remains a hard working organization of top-notch electricians and like-minded professionals committed to benefiting towards the integrity of our industry. We represent the highest standards in the electrical field for workmanship quality and education, while bridging the gap between contractors and members’ relations. We are an electrical union committed to bettering the lives of our members and the teams of talented contractors we work with. Who Owns and Operates the IBEW Local 586 Ottawa? Every year, IBEW Local 586 Ottawa sees significant increases in membership, contractors, and industry leading monetary advances. This is a trend that IBEW Local 586 Ottawa continues to strive for every year, as a promise to its loyal members. Why Do Contractors Work with the IBEW? Contractors choose to partner with IBEW Local 586 Ottawa to make sure the job gets done well and on time. We provide a skilled workforce that is second to none. John Bourke, Business Manager and Financial Secretary of IBEW Local 586, and his staff are committed to professionalism and providing contractors with 100% transparency with all important aspects of the organization’s dealings. We work with contractors to better their business by providing reliable workers who are focused on getting the job done on time, on budget, and completed properly. IBEW Local 586 Ottawa is dedicated to providing a skilled workforce that will shape the future of the electrical industry in Ontario. It’s our promise to contractors that we will make your business successful, if given the opportunity. Our record speaks for itself. 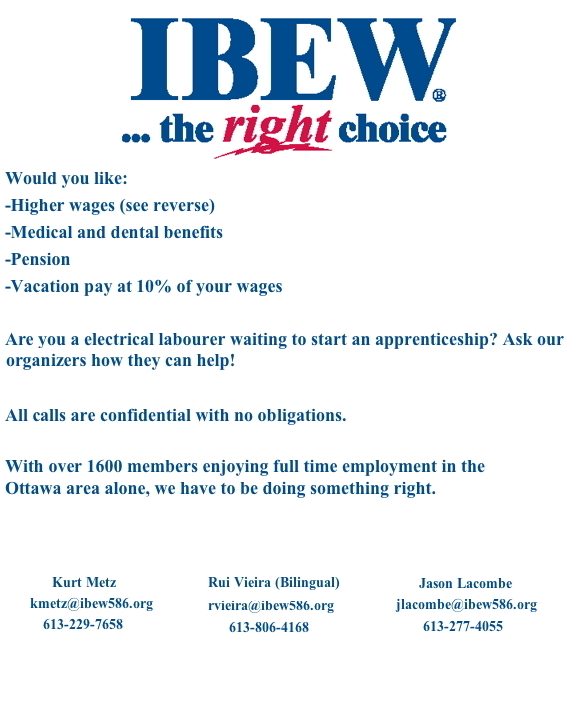 Licensed electricians and registered apprentices choose IBEW Local 586 Ottawa because of our high standards with wages, pension, education, work ethic, and our commitment to the trade. IBEW Local 586 Ottawa has developed a reputation as being an honest, fair entity that represents a highly skilled workforce. Our integrity as an electrical union in the industry is second to none. What makes us different from other unions, is our dedicated attention to building a stronger relationship between electricians, employers, and government in the province of Ontario. Our reputation in the industry is strong. Our integrity as a highly skilled workforce has helped to continue developing our relationships in the construction industry. 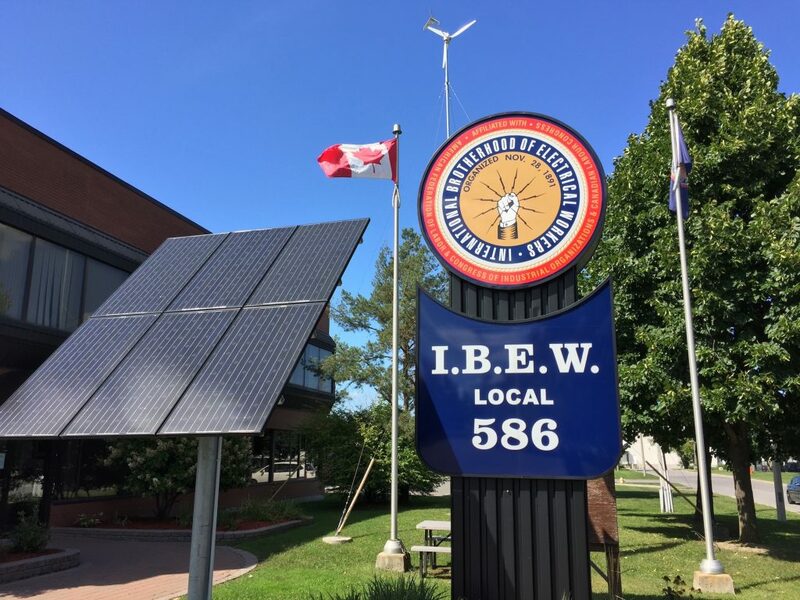 Members of IBEW Local 586 Ottawa remain with us because the IBEW is dedicated to maintaining and strengthening the relationship between members and employers. We are a brotherhood of highly skilled professionals devoted to building a better future for everyone in the construction industry. A strong network of like-minded professionals.